Mirenesse Fast Fix Solutions Ice Crystal Cryotherapy. Mirenesse Wrinkle Free Collagen Mask is a mask specially formulated to reduce fine lines and wrinkles from skin instantly giving you a smooth flawless looking skin for that special event. 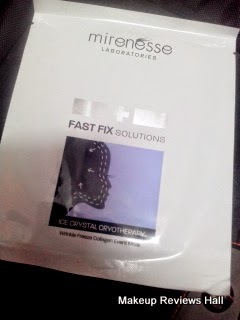 I got this Mirenesse fast fix ice crystal cryotherapy wrinkle freeze collagen event mask from Luxola, along with its Pebble Sonic and instant lash volumizing mascara for review. Initially I felt whats the need of this anti aging mask, when I am only in my mid twenties. But since few days I realized my skin lacking all glow, natural oil in this winter, because of which its looking severely dry with highlighted line and wrinkles. I felt this could be the best time to test this wrinkle freeze mask. I tried this on my dull rough skin and here is the review on this collagen mask from Mirenesse. What Mirenesse Wrinkle Freeze Collagen Event Mask Claims? Need to look years younger for a special event? For an instantly radiant complexion! Rejuvenate your skin to look much younger with a Cryotherapy infusion of moisture, Collagen and revitalising botanicals and peptides. Cryotherapy is the newest innovation in wrinkle and fine line treatment. By applying an ice cold treatment to the skin, it literally acts to freeze wrinkles in their tracks! Blood flow to the area is increased and toxins are flushed away resulting in an instantly smoother, refreshed looking complexion. We've harnessed the power of Glacial Ice Crystals, and the Cryotherapy technology so you can experience this cutting edge treatment at home! This Clear hydrogel matrix mask infused with 40 fabulous ingredients for an immediate rejuvenating boost. The benefits of a full bottle of anti-ageing serum in every mask! Restores brightness and translucency to the skin providing fabulous hydration with smaller looking pores and tighter smoother looking skin. Skin is now ready to receive makeup for a perfect look for day or evening! Regular use keeps skin in top condition and helps fight against aging. This one time usage collagen mask comes in a thick packaging, not a all cheap like some of the disposable and one time usage products. The packet contains two pieces of this, one for upper portion and one for the lower, so no hassle. The mask has to be left on skin for minimum fifteen minutes, so I just applied this collagen mask after cleaning my face nicely using my regular face wash.
Read : Drink Water to Reduce Wrinkles Naturally. Amway Foundation for Wrinkle Free Skin. After application, I could feel the mask is little slippery and does not stay on the face even if you move a bit around. So I had to lie down for that period of time & after about twenty minutes, I just removed the mask and guess what. I saw a totally new very fresh and younger looking skin. There were absolutely no signs of wrinkles, fine lines or what so ever but just glow and healthy smooth skin. I have lot of open pores on my right side, even they appeared to be somewhat tight and small after the application of the mask. Normally I face lot of problem while applying my normal makeup in winter since it makes skin look even more dry and rough. But this time after using this wrinkle freeze collagen event mask, I could truly feel the magic on my face after using my normal foundation. This time my skin was glowing, looking very smooth, healthy and all this because there were no lines at all. I am very impressed by the amazing quality and effect of this Mirenesse Fast Fix Collagen Event Mask and would recommend it to everyone since its one of the best solutions to vanish wrinkles instantly at least for a specific function where we want to look our best. I feel all of us should have few packs of this collagen mask with us every time, to look beautiful and glowing any day anytime in just few minutes. Instantly removes wrinkles as claimed. Makes skin glowing and healthy. Makes makeup application very easy after mask application. Face look bright and radiant. Quick and easy way to get rid of wrinkles. Available in India with free international delivery by Luxola. Collagen mask can be used only once. Lillte expensive considering one time usage. Gives temporary result for just few hours.